Flowers are so beautiful and delightful, which each flower has its own meaning. They represent happiness, beauty, clarity, positive vibes, and death. Universally, a flower is a good symbol of life, but those petals can also represent death and bliss in the eternal life. Many people choose to celebrate death with a gift by sending flowers. Which flower means death? We’ve selected flowers that represent death with shockingly symbolism meanings. Which flower means death? Undoubtedly, the best answer is black rose! It is absolutely true that black is the color of death. The black rose, simply because it represents death, also point to a most important change or cataclysm in the future. 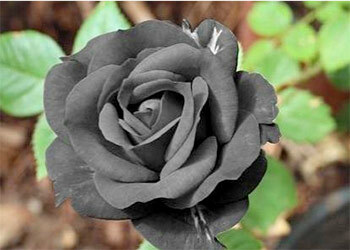 Black rose is also called black beauty, black jade, and black magic. These flowers are ideal for Halloween, a right addition to the ribbons along with candles, black clothes, and etc. Hate, revenge or infidelity is another representative symbol of these flowers. However, the meaning of the black rose also includes bravery and struggle. What flower mean death? Marigold! 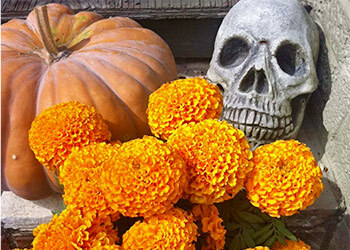 In Mexico and U.S, there is an unusual event that focuses on the intimacy of family and friends and remembering those who have passed on named Dia de Los Muertos. Marigold flowers are an important part of that holy day. They are sprinkled to help guide the spirits home and also left as special gifts on graves and shrines. Marigold flowers produce a strong aroma that is thought to invite souls to their offerings or guide them back to their burial place after coming up. Chrysanthemums are a very large diverse group with various species. This is a flower that significant as a symbol in Japan. One main meaning of chrysanthemum in Japan has to do with death. 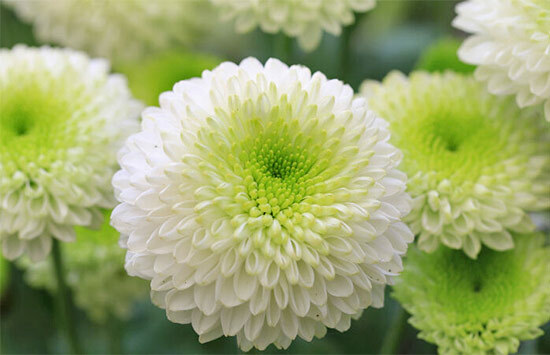 Chrysanthemum is usually used at burials because of the association with death and sorrow. For this reason, do not give anyone within Japan because flower means death! In several European nations, this flower symbolism also has to do with death. The only period chrysanthemum flowers are given in these nations is as a symbol of security, grief or sadness. See also Single Yellow Rose Meaning? If you ask which flower means death, then Lily is a good answer. In folklore and myth, the representation of the lily spoke of purity and transparency and became allied with unworldly and metaphysical meanings. This is frequently reflected the go-to funeral flower, there’s substantial meaning behind this aromatic blossom. Lily meaning at burials also embraces the idea of the cleansing of a dead soul, particularly when the flowers are white in color. Metaphorically, these flowers promote the idea that the soul of somebody has returned to a state of purity. There are many flower names that mean death, one of them is gladiolus. They are a common and old-style choice for memorials and are frequently used to send the strength of charisma and moral reliability of the deceased. Gladioli became widespread in the US in the early twentieth century, resulting in the creation of the American Gladiolus Society in 1910. They can grow up to 7 feet tall in good conditions and normally bloom in the summer season. Sometimes they are called the Sword Lily just because they are composed of many flowers growing upward along the stem. Carnations are linked to death, as they are used in gifts and wreaths that decorate funerals and burial ground. Yes, carnations are a common choice for empathy arrangements, particularly because they have a long-lasting scent. Carnations come from the Mediterranean and they are one of the most symbolic flowers of Spain. This flower is an olden flower, and many Christians believe that carnations flourished from the tears Mary. They also serve to express recall. Their existence reminds us obviously of someone who we love but who isn’t there or of a friend or family that we are very close to. Sometimes, flowers say what you can’t say. For example, at a funeral or time around the death of a loved one. Don’t ask which flower means death again, you can see flowers that represent death mentioned above. When you are picking flowers for your loved one’s burial, you may want to consider these flowers. Next post Which Flower Means Hope ?